If you are an enthusiast of tabletop gaming and haven’t heard of the Warhammer 40k series, you should be slapped silly. Kidding aside, its not a joke that WH40K remains one of the most played and talked about tabletop games in the industry, It is easy to get lost in the amount of hours required to master the game and become a strategically sound player. The Warhammer universe is composed of several races, including the Orks, Imperium, Chaos, and Eldar. There are more than 20 sub-factions within each race. The lore of the series has spawned a series of books spanning several volumes. 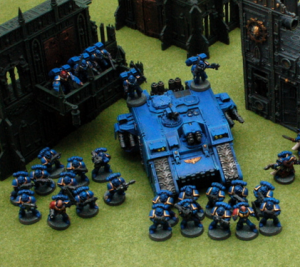 Many players fall in love with the game to the point that they get toys or t-shirts branded with space marine images. Another pinpoint to the series’ popularity is the amount of games developed using its setting, themes, and characters. One of the most popular RTS games is Warhammer: Dawn of War. This was a real-time strategy series that allowed players to maneuver through the universe of WH40K with an Age Of Empires type style of gameplay. There are several Warhammer 40k stores in Los Angeles that specialize in selling scenery, miniatures, and premium box sets pertaining to the game’s world. One of the most notable is Games Workshop, which is located in South Central Avenue in Glendale, California. Games Workshop is recognized in the community as the developer and publisher of the Warhammer series. The store they have in Glendale is a great place to get started on Warhammer wargaming.